Of course, this is the conversation I have with all of my brides in the studio a week or two before their big day. We discuss all the critical details of their wedding day; we plan out timelines, image capture request, locations, you name it we review all of it thoroughly. But and I do mean a big “BUT” then the wedding day arrives and with that comes all the excitement, nerves, and organization…. or lack of following any scheduled timeline that was planned out… Now let's not take any of this personally, it happens to every bride and every wedding. I should know I have been to 3000 weddings or so and counting. What is Bridal Coverage or Getting Ready Coverage; it is more complex than most of us realize. This part of your day is where your story begins, but also it has many moving parts that need to come together so the rest of your day can flow with ease. Here is a break down of all the components you will be dealing with at the start of your day. My hope is you can use this helpful information to navigate a straight line without too many distractions to get to your ceremony and amazing reception on time! 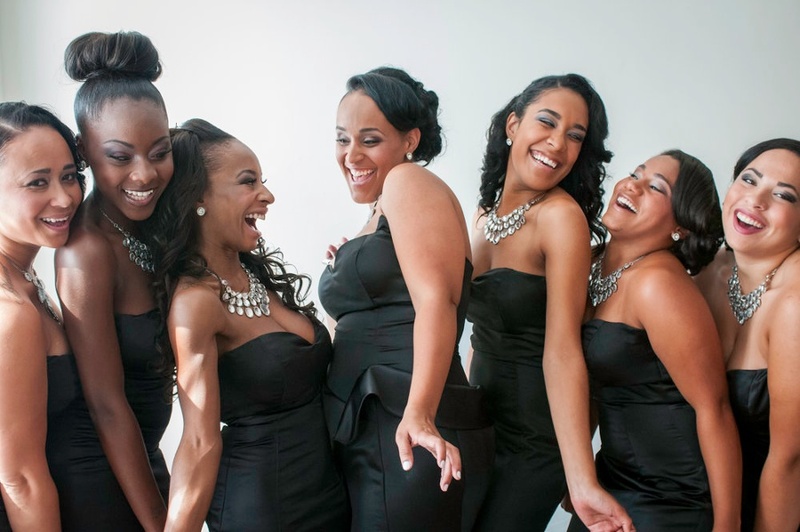 Coordinate with bridesmaid and others that are included in the getting ready coverage and have a timeline for their arrival. Have them stick to it; many times there are late arrivals. Coordination with Hairstylist & Makeup Artist; Know how long they will be working with each person and consider extra time for anyone with lots of hair, this will undoubtedly take longer than predicted. If you are going to their salon always remember to add your travel time to and from the salon; this will most likely add an hour even if the salon is close, remember there is a lot of conversation happening so everything you do will take longer than a typical day. Once hair and makeup are underway, enjoy, this glam session, this is a once and a lifetime experience so enjoy a little TCL. Have Flowers delivered to your location near the end of your glam session, so they stay fresh and vibrant, Have a point person to welcome your florist in and have a place chosen for the large boxes of bouquets they will be stored. Having your Gown, Jewelry, Wedding Shoes, Invitation, and any sentimental piece in easy reach for us to start right in with our storyline coverage is a great timesaver. Photography & Video arrive about 2 hours before your ceremony start time; this should be at the very end of your hair and makeup session, so everyone is ready to put on their dress when we arrive. There is a lot to capture so the more organized you can be the more amazing images and details we can capture. 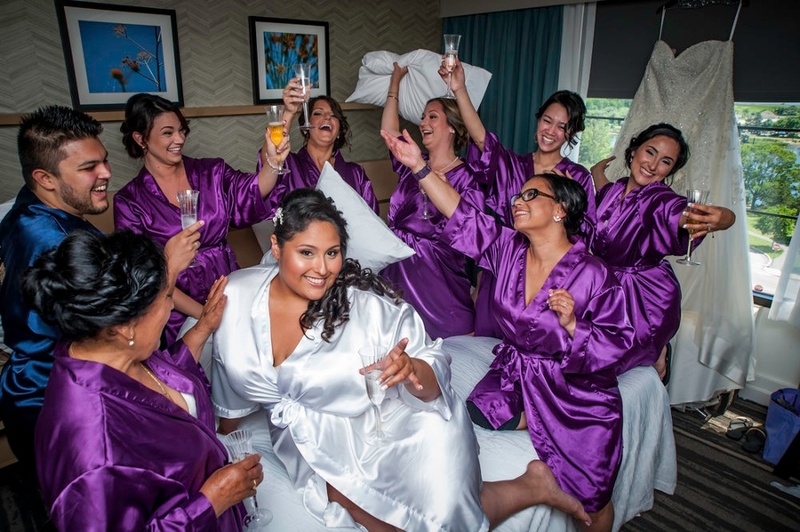 Our goal for getting ready coverage is to start with you and all your girls having a champagne toast in your robes and capturing spontaneous and natural images of you enjoying the day. Then we will set you up for stepping into your gown with your bridesmaids and your mother helping with this process; we then take many images of you putting on jewelry, shoes and wedding veil. 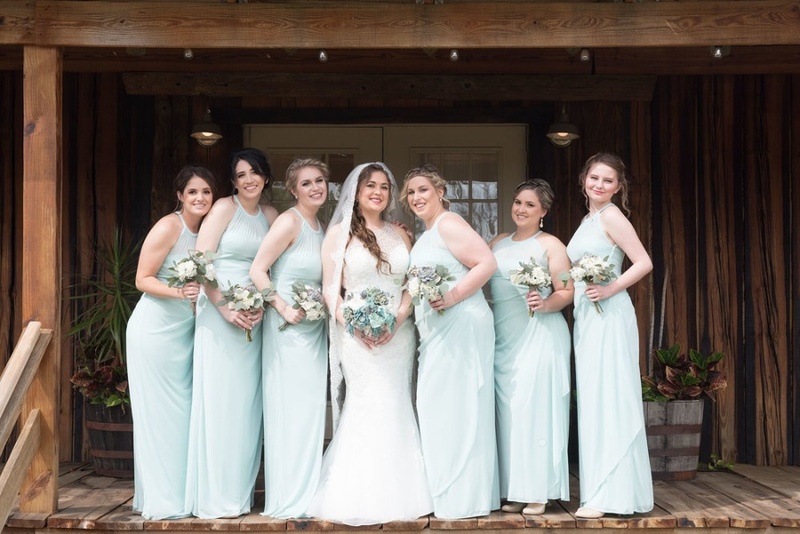 Once you have completed the dressing stage, we will take pictures of you alone in beautiful portrait lighting, photograph you with your parents and you with all of your bridesmaids. This coverage tells such a beautiful story you will see the emotion, excitement, and nerves in every image. Now it's off to your ceremony, this will add 30-40 minutes to your timeline for travel, plus getting in & out of cars/limos/ or trolley, so let us make sure we add this in! We can now meet up with your Groom and his men and start Grooms Coverage. We will photograph all of your detail items if you have all the bridesmaids dresses hanging up with your gown this makes for a beautiful addition to your detail pictures. Our goal for getting ready coverage is to start with you and all your girls having a champagne toast in your robes you stepping into your gown, with your bride. Which is my acronym for; Timing, Laughter, Conversation. Now for timing, we can all say that for your wedding day there are a lot of things to plan out. most of my clients feel they have planned a timeline pretty well until we start breaking it down together. Your Getting Ready Coverage is full of distractions that most of us don’t foresee; There are so many things happening while you are in the process of getting ready that we forget to make time for so your day can quickly fall off track. What I want most for you is to educate you in all things weddings. This way your day runs as smooth and effortless so you can enjoy the Dream Wedding you planned! Timing - When you are planning for Bridal Coverage/Getting Ready Coverage this includes much more time than most Brides realize. You will be having hair and makeup done either on location or at your home, and this takes up most of your morning, so it is super important to be clear with your Hairstylist & Makeup Artist what time you need to be finished/done. Yes, I am saying plan backward. You want to know how long it will take times the number of women they will be styling, plus doing professional makeup. Then I know this sounds crazy, but I want you to add at the very least one hour to the time frame of completion! They start to set up all of their products and tool which realistically takes about an hour. Did you add this hour to your timeline...hmmm now you know.